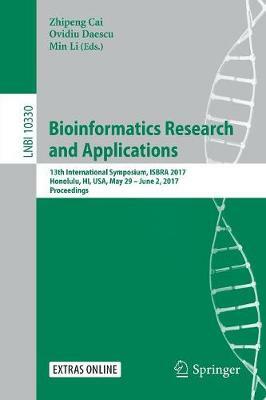 This book constitutes the proceedings of the 13th International Symposium on Bioinformatics Research and Applications, ISBRA 2017, held in Honolulu, HI, USA, in May/June 2017. The 27 full papers presented together with 18 short papers and 24 invited abstracts were carefully reviewed and selected from 131 submissions. They cover topics such as: biomarker discovery; biomedical databases and data integration; biomedical text mining and ortologies; biomolecular imaging; comparative genomics; computational genetic epidemiology; computational proteomics; data mining and visualization; gene expression analysis; genome analysis; high-performance bio-computing; metagenomics; molecular evolution; molecular modelling and simulation; next-generation sequencing data analysis; pattern discovery and classification; population genetics; software tools and applications; structural biology; and systems biology.